A 51-year-old male presented with a wound in his right hand that was suspicious for possible septic emboli of cardiac origin. With transesophageal echocardiography, the patient was found to have a rare quadricuspid aortic valve. 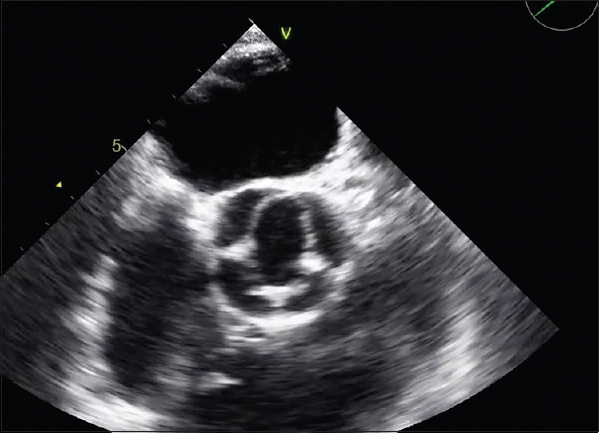 This quadricuspid valve can present with variable symptoms and physical exam findings. Due to embryological defects, this pathology is associated with several other anatomical defects that are important to recognize prior to surgical intervention. Transesophaegeal echocardiography remains the gold standard in detection of quadricuspid aortic valve and identification of other possible cardiac lesions. A 51-year-old male presented with a nonhealing wound of several weeks on his fourth and fifth digits in his right hand. On physical examination, the patient was found to have a diastolic murmur in the aortic region, while the hand wound was concerning for possible septic emboli from the cardiac origin. The patient denied any complaints of chest pain, dyspnea, and palpitations. The patient underwent transesophageal echocardiography to examine for possible cardiac lesions. Incidentally, it was found to have a quadricuspid aortic valve associated with severe aortic insufficiency seen in [Figure 1] and [Figure 2]. Aortic regurgitation, endocarditis, ankylosing spondylitis. Quadricuspid aortic valve is one of the rarest forms of valvulopathy documented with an incidence around 0.01%–0.04%. It has been hypothesized that during the 5th week of embryogenesis, disruption of the mesenchymal ridges from fusing leads to this presentation. This valvulopathy has been documented to have a predominance for men, with a mean presenting age between 45 and 60 years of age. Although the patient presented without any revealing symptoms, the quadricuspid aortic valve has been reported with chest pain, dyspnea, palpitations, and syncope. Importantly, this anomaly is associated with other anatomical abnormalities such as aberrant coronary arteries, ventricular septal defects, patent ductus arteriosus, and pulmonary stenosis. Although this patient had severe aortic insufficiency, it is imperative to evaluate for these possible abnormalities before valve surgery. 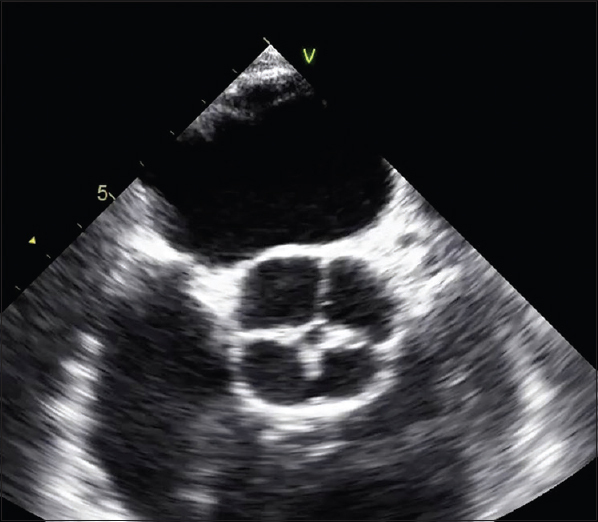 Transesophageal echocardiography is considered to be the gold standard for the detection of this rare valve anomaly, as well as its associated anatomical cardiac defects. Of those with quadricuspid aortic valve associated with aortic insufficiency, 50% of that population will require surgical intervention in their lifetime. However, this patient was lost to follow-up. Vasudev R, Shah P, Bikkina M, Shamoon F. Quadricuspid aortic valve: A rare congenital cause of aortic insufficiency. J Clin Imaging Sci 2016;6:10. Savino K, Quintavalle E, Ambrosio G. Quadricuspid aortic valve: A case report and review of the literature. J Cardiovasc Echogr 2015;25:72-6. Malviya A, Jha P, Ashwin, Mishra J, Srivasta P, Mishra A. Quadricuspid aortic vave – A case report and literature review. Egypt Heart J 2016;68:271-5. Yuan S. Quadricuspid aortic valve: A comprehensive review. Braz J Cardiovasc Surg 2016;31:454-60. Karlsberg D, Elad Y, Kass R, Karlsberg R. Quadricuspid aortic valve defined by echocardiography and cardiac computed tomography. Clin Med Insights Cardiol 2012;6:41-4.